“It’s going to get really hot,” artist Sam Lewitt says when standing amongst in his most recent works. Thirty minutes before our meeting, Lewitt activated a series of custom-designed flexible copper heating circuits—a form and material that he first explored for previous solo exhibitions at The Wattis Institute for Contemporary Arts and Kunsthalle Basel. Though the copper-clad etchings coated in thin plastic were already at a temperature of 114-degrees Fahrenheit, they would soon be converting the incoming electrical energy into 170-degrees of dissipating heat. 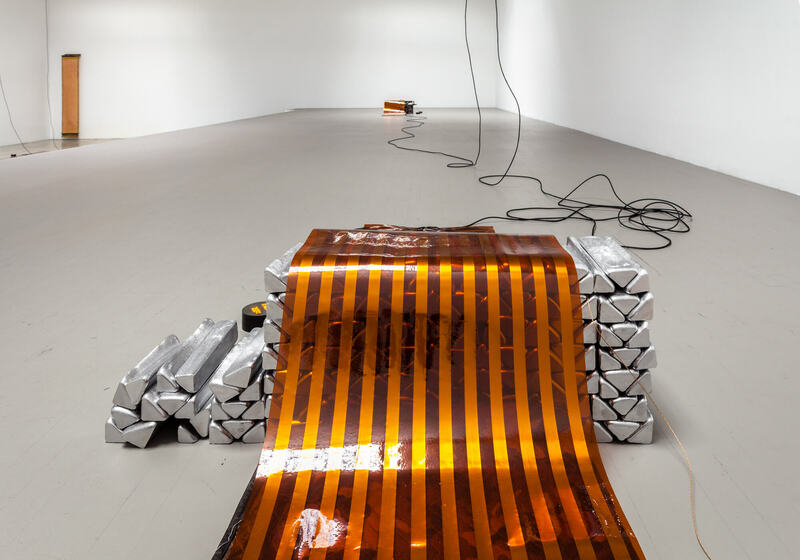 On view at the Swiss Institute and titled “Less Light Warm Words,” the series of work was created to exhaust the precise amount of power running through the space’s electrical lighting grid; Lewitt’s copper heaters, laying on the floor with chords running to the ceiling, replace the Swiss Institute’s fluorescent lights. Taking cues from precision technologies that require stabilized temperatures to properly function, Lewitt’s micro heaters are magnified versions of those used within devices such as cameras and cell phones, as well as satellites and medical equipment. So even though “Less Light Warm Words” draws overt attention to electrical infrastructure and modern technology, it simultaneously, albeit subtly, incorporates linguistics: Each copper wire pathway is an abstracted couplet, derived from the vocabulary used when speaking or writing about these heating systems. We met with the New York-based artist to learn more about his research and process. EMILY MCDERMOTT: You’ve done other iterations of this project, so why did you want to return to it again, this time in New York? SAM LEWITT: The work is about a capacity to circulate. It’s a capacity that is based on rationalized standards of visibility that remain invisible. By that I mean global standards that go into planning things like electrical infrastructure. These heating circuits are calculated, planned, and manufactured to bear the load of power that flows through the grid. It’s a standard; anywhere you are in the world, lighting grids are supposed to be isolated. Since the work is about that reach of circulation, it can’t be site-specific—at least not in the rigorous, historical sense that I understand it—but neither can it be fully autonomous or independent. I can’t just have that be a hypothetical statement; it really has to move through these different sites. In fact, the work came about because these two different institutions, the Wattis [Institute for Contemporary Arts] in San Francisco and the Kunsthalle Basel, approached me to do a show they were collaboratively producing. I’d been working with this material since 2013. MCDERMOTT: What originally prompted you to start working with it? LEWITT: It’s a long story, but essentially I was detained by the police for photographing this giant data server in New Jersey, which, at the time, in 2012, executed all the trades for the NYSC. I had gone out of curiosity to see what it looked like and I brought my camera. I was expecting to be turned away, but instead I was detained and the photos were erased. I thought, “The pictures don’t tell you anything,” and that’s quite interesting to me. There are artists that seek to show the structure of power, but I’m more interested in the structure of the invisibility of power. MCDERMOTT: A lot of your work deals with making that which is intangible tangible. LEWITT: Right, tangible but still in their intangibility in some way. The goal is not to lift the veil and show the truth that lies beneath. MCDERMOTT: It’s more so to magnify what is creating the veil? LEWITT: Right. Even the texture of the veil itself is a material reality—sorry to extend that metaphor too far, but the stitching of the veil is as much a material and constituent component of techniques of power as what ostensibly lies behind it. A veil structures this invisibility/visibility dichotomy. I’m interested in how that sort of thing emerges as a structure in the world. Anyway, so I went [to the data center in New Jersey], they erased my photos, and I thought it was interesting because the photos didn’t show anything. I never wanted to make the photos into artwork; what was more interesting was that the control center of the camera is composed of this flexible circuit material and the same is true for the servers, so there’s a material correspondence. Everything about this circuit material corresponds and coincides with high level, ideological descriptions of the subject of flexible culture. It’s all about custom profiling, flexible control, belonging anywhere, etcetera, etcetera. It’s this very familiar ideological pat, and links to how language transmits something beyond itself semantically. So I started using the material by figuring out how it worked. It’s an etching. It’s not technologically sophisticated. It’s a piece of copper on a piece of plastic. The piece of plastic is quite sophisticated in terms of being able to resist heat, but it’s an etching. So it has this link to art historical modes of reproduction that I could learn to do myself. MCDERMOTT: Why did you decide to use the electricity specifically from the lights? LEWITT: For all those reasons about visibility that we were talking about, but also because it’s an environmental aspect of the experience of artworks. Also, the two institutions that asked me [to do this project] have a very particular relationship to the porosity of the space to natural light despite being very different architectural typologies. The Wattis is a garage that’s been re-programed to meet the conditions of California, breezy air and light architecture. The natural light is evened by a rigorously set grid of lights that diffuse it optically. In Basel, the top floor, which is the gallery I was showing in, is a huge room with a 75-foot long skylight. It has this very potent, rhetorical effect beyond your physical experience. I was especially interested in the fact that it’s the one room in the museum where the fluorescents are above the glass of the skylight, so you don’t see them from within the room. We had to remove the thermal diffusion glass and then take out the 280 bulbs. That set a constraint of what I could do with this material: I’ll put as much electricity through it as I can and run it up to the maximum temperature that I can; the number of heating circuits will correspond to the maximum amount of energy that I can pull from the lights. In other words, if they plugged in a light, it would blow the whole system. MCDERMOTT: In the previous two exhibitions, there were light switches. Do you turn them off at the end of the night here? LEWITT: Yes. I’m not putting it in this exhibition, but in the previous two there was a thermal camera in the space and it was the only documentation during the show that I said could be released, this live feed of the space. They turned the lights on and off as they would with any other show and the lights became a way to track the labor patterns of the institution. The thermal camera came about because I was suspicious of installation photography, in terms of its goal of giving a synoptic, generic overview of what was there. This work is particularly vulnerable to static installation shots, because there is this non-visible process happening. The optical quality of the show can lure you in to fetishizing whatever that is. MCDERMOTT: Clearly there is a lot of research that went into these projects, much like all of your artworks. Can you tell me about what the research process is like for you? LEWITT: It’s important for me, whenever I start working on something, that I be able to learn a new language and learn how to access very public techniques that are all around us, but that have very specialized or privatized structures. So I read a lot about how these things work and how they’re made, with an eye not to become an engineer or specialist—because I am not interested in that at all—but for the kind of language that is used and how that language exceeds the disciplinary range of its supposed applications. I’m not really even interested in technology, per se. It’s about how [technology is] built into and how it builds up the concepts and languages that we use to negotiate everyday life. MCDERMOTT: This might be a stupid question, but are the works actually hot? Can you put your hand on them once they’re heated? LEWITT: That’s a really good question, actually. It says 114 degrees [Fahrenheit] and it’s going to go up to 170, but you can put your hand on it. It’s so thin that it’s letting go of the heat immediately. It’s like this factory that outputs heat immediately because the material is not thick enough to hold onto it. It can run up to 350 degrees. These have no architectural applications, besides being vacuum-sealed into small housings; they’re supposed to produce stability, homeostatis, not a hot environment. The width, length, and depth of this etched copper line is calculated down to the millimeter to convert a certain amount of electricity to a certain temperature. It’s purely resistance based. So it receives the electricity and it heats up, but then this space is too porous, too imperfect, that it produces a raw gradient. I think that’s interesting. We’re working off an electrical grid, and a grid is this orthogonal structure that’s infinitely expandable and retractable, but these things produce a temperature gradient, which is about material intensities. It doesn’t produce the same kind of subject as a grid because it’s too fragile; it’s too open to very fine-grained differences and contingencies. I like that. [laughs] But as you move and conduct air through the space, it responds to you and then struggles to get back to where it was. I like that these things that are supposed to produce stability and be highly regulated and controlled are put in a situation where they’re very fragile and vulnerable. LEWITT: That’s because there’s no information. [laughs] It’s with my friend, Lucy Raven. Four of the heaters from Kunsthalle Basel are going to a private gallery. They will max out the electrical system there, but after that, I’m not going to do it anymore. MCDERMOTT: What makes you feel like its finished? LEWITT: It’s gone in lots of different spaces, including at an AirBnb that I rented for a week in New York. It was important that it was an AirBnb because of their motto “Belong anywhere;” I wanted to invert that. That’s also the language used with these heaters. So it went into this space that was a light industry space-turned-creative class living that was then financially hedged. AirBnb runs off of the exchange of private monies for housing whose effect is the privatization of city infrastructure. I plugged four of these into the electrical system and for a week had people come in to see it. It was clandestine, but it was important that [this project] existed in a non-institutional context. Regardless, to answer your question, I’m done. It’s over. I cannot let myself get bored with this. I fear that if I do it again, it’ll become a stylistic thing and I don’t care about that. There are two kinds of boredom: the kind I like, the kind that makes you concentrate a little harder; then the kind which is a purely entropic gray zone, and I’m almost there. “SAM LEWITT: LESS LIGHT WARM WORDS” WILL BE ON VIEW AT THE SWISS INSTITUTE UNTIL JULY 24, 2016.